Yesterday, I shared with you the second step of being mindful in your eating, Observation. I asked you to really get in tune with your body. I asked you to step outside of your body and really see what is going on. At this point in the process, I’m not asking you to change anything that is going on. I’m only asking you to notice and really pay attention to your actions and thoughts. For more details, I would love for you to check out the article so you can understand what I’m talking about. At the end of that article, I told you I was going to give you some extra little tools to help you out on your journey to being a more mindful individual. I decided to make this little table for you. I suggest printing it out and putting it on your mirror or maybe on your fridge or pantry door where you’ll see it when you go to grab something to eat. Use this scale several times a day. As you are doing your regular activities, stop and attach a number to your level of awareness of your body. 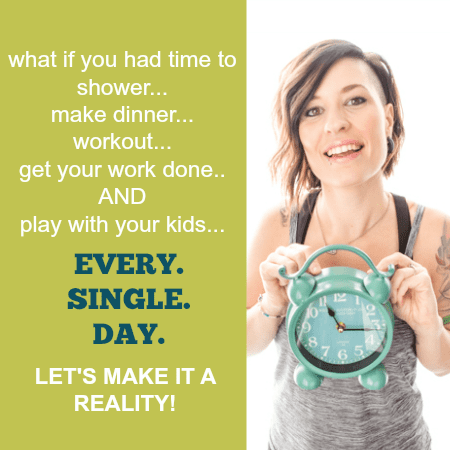 You may wish to choose a specific time or setting each day, such as right before lunch of on your way home from work. The scale will help you gauge how in sync you are with your body. It is helpful to continue to check in with your body frequently. Learn to hear your body! 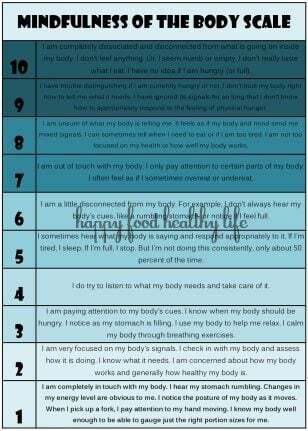 Click on the link below (not the actual picture – that won’t be big enough to be easily readable) to get your free printable Mindfulness of the Body scale. Where do you think you are on the scale the majority of the time? For the record, I’m at a 5 most of the time. Is that surprising? Were you expecting me to be a one or a two? I’ve come a long way from where I was a couple years ago (probably a 10… or worse, if that’s possible), but I still have a long way to go. I’ve said it before, and I’ll say it again. I’m not just here to help you, but I’m here to help you while I continue my life-long journey to complete health and happiness. None of it is easy, but I know this much – it’s easier with you guys by my side!